Sub-horizontal porphyry sill, Letterbrat Quarry, Plumbridge, Co. Tyrone. The importance of this site lies in the age of its rocks, which are the earliest in the ancient Dalradian Supergroup and in the presence of a very thick intrusion (an injection of molten rock) of porphyry (a rock with larger well-shaped crystals in a finer groundmass). 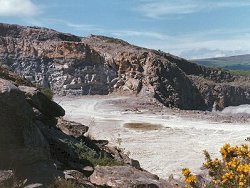 The Letterbrat Quarry is worked for road stone and exploits the grey, quartz-rich metamorphic rocks of the Newtownstewart Formation, the lowest division of the Argyll Group which the lower of the two major divisions of the Dalradian rocks of Northern Ireland. The rate of exploitation of this hard rock means that the working faces are constantly changing in appearance but generally there are thick beds of psammite (a quartz-rich rock) separated by thinner units of phyllite and pelite (previously shales and clays). Although formed over 600 million years ago, these rocks were not metamorphosed until 465 million years ago when they were involved in a collision between the continent of Laurentia and an active volcanic arc, which buried them deeply while at the same time creating a gigantic regional overfold extending across Northern Ireland into the Highlands of Scotland. Despite the immense forces involved, the degree of metamorphism was relatively low on the scale of alteration. At the northern end of the quarry there is an intrusion, 10 to 20 m thick, of orthoclase feldspar crystals, up to 1 cm long, in a finer grained feldspar-rich matrix. It also contains silvery, dark green and bronze micas with rounded quartz and, less commonly, hornblende accompanied by a scattering of cubes of fool's gold. It is inclined at 30 degrees to the north west. There are other, similar, dykes in the area around the quarry. These intrusions are not deformed and therefore are assumed to be later than the metamorphism but they do not cut the Carboniferous rocks of the area and so predate them. It seems likely that they were intruded during the Devonian period, roughly around 400 million years ago. The site is sufficiently interesting to be a candidate for designation but much will depend on the final quality of exposure when working ceases. The outcrop of the Newtownstewart Formation is among the best, as is that of the porphyry, while the position of the quarry at the core of the Sperrins Overfold (the local name applied by geologists to the structure extending into Scotland) offers additional research interest.